Lighted items included maracas, frisbees, slap bracelets, yard dog glasses, boas, necklaces, and rings. Eve apple beads and emblemed items. Also look for the Krewe's most collectable throw which are individual float themed beads and special Captain lighted apple beads. Unique to the Krewe of Eve, krewe members decorate sweat suits to create their own colorful costume. 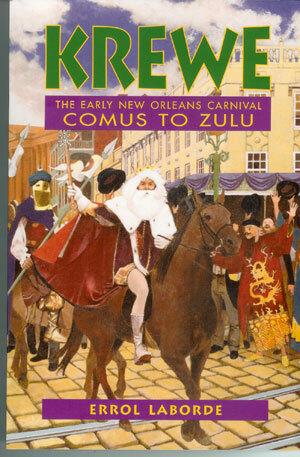 In 1986, six local residents decided to form a ladies' Mardi Gras Parade Krewe. After many weeks of gathering information, they gave a party and invited local women. From this gathering, the Krewe of Eve started with 260 ladies. 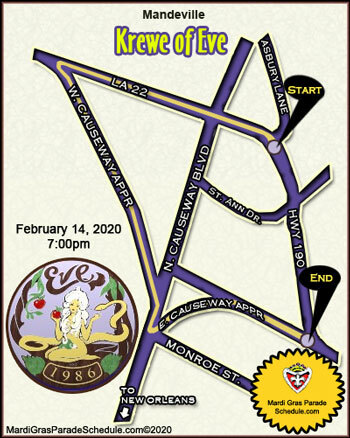 The Krewe of Eve first paraded in Mandeville on February 14, 1987, with their first theme, "Famous Lovers" and on January 25th, 2008, with over 546 members, the Krewe of Eve presented its twenty-second parade, with the theme, "Eve's Fascination with Animation." While the Krewe of Eve is noted for it's beautiful parade, The Krewe of Eve has supported many civic endeavors in the local community. The krewe annually participates in the gift giving program through the Mandeville Police Foundation and donate food to the Samaritan Center and Covington Food Bank.